The identities of the three young children murdered in their Texas apartment on Thursday have been revealed. 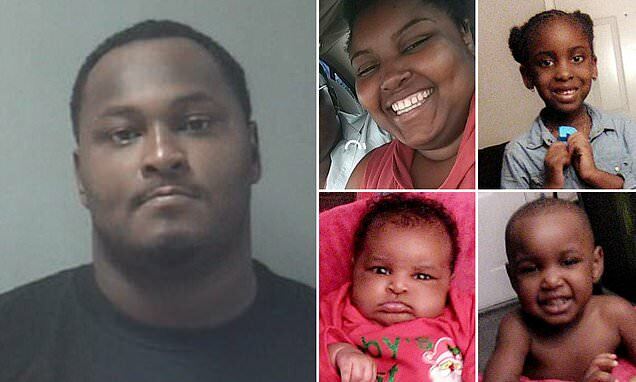 Six-week-old girl Ashanti Mehmood, two-year-old boy Prince Larry Brown and five-year-old girl Angela Pilot, were slayed in the incident that took place in the Texas City home located very close to a police station. Their mother Kimaria Nelson, 24, was shot in the head and was fighting for her life on Friday. She shared the youngest baby, born a day after Thanksgiving, with suspect Juniad Hashim Mehmood. It has not been confirmed exactly how the children were killed. Recent images show the tot's elder sibling mesmerized her as they celebrated Christmas. They received the 'incoherent' call around the same time they obtained warrant for his arrest. Reports say he sounded audibly distraught when held in the back of the police car. Mehmood was charged with aggravated assault with a deadly weapon although the investigation continues and his charges are expected to be updated. He was being held without bond. The suspect was wanted by police after a concerned relative called them to Pointe Ann Apartments at around 6pm Thursday. Their grandfather Taurus Nelson, who is Kimaria's father, said the innocent little ones didn't deserve to be victims. Nelson was rushed to University of Texas Medical Branch, a Galveston hospital, and underwent surgery. She was in stable condition Friday.